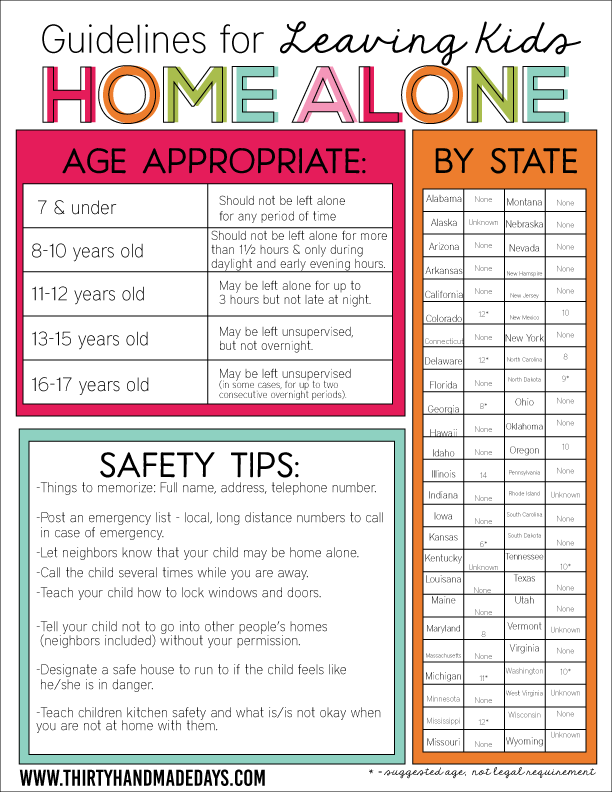 A friend of mine recently shared a chart that showed guidelines for leaving kids home alone. It created a dialogue amongst some friends, much like conversations I’ve had many time before. There’s a lot of debate on the topic and some strong opinions. The really hard thing (at least here in the US) is that each state has different laws and suggested guidelines. I’m not sharing to spark a debate but more to give information and encourage each other. So if you’ve ever thought ‘when can a child stay home alone’ then keep reading. Way back in the day I started babysitting for other kids when I was 10. I babysat 5 kids that I think were 8 and under. I cleaned the house (I can still picture the crazy mess of this particular family- oy!) and I got paid $2 an hour. What a steal of a deal! So when it came time to be left alone, it wasn’t that big of a deal. If I could handle other people’s kids, I could handle myself. Times have definitely changed over the years. We used to play outside all afternoon until it was dark and not really have to check in. Now it’s just not that way. I think it’s for a combination of reasons- scarier world, more aware, unsafe situations, media, etc- but things are definitely different. That means that leaving kids home alone isn’t as common as it once was too. What Age Can Kids Stay Home Alone? Age is a factor for sure. I don’t think that any 5 year old (“mature for their age” or not) would be okay to be left alone. But age isn’t the only thing to consider. Every child is so different. One of my kids will never be able to stay home alone and yet another who is young is the most responsible of the three. How long will you be gone for? Does your child follow directions? Will they go by the rules while you are away? Are there other kids left home too? How many and how old? Would your child feel safe staying alone? What they can and cannot do. Be specific so there is nothing left unsaid. How to lock/unlock the doors and windows. Do a test run of this to make sure they know how to use all of the locks. Talk about safety and the importance of not answering the phone and door unless it is you. You can read all about safety and emergency evacuation plans and more here. 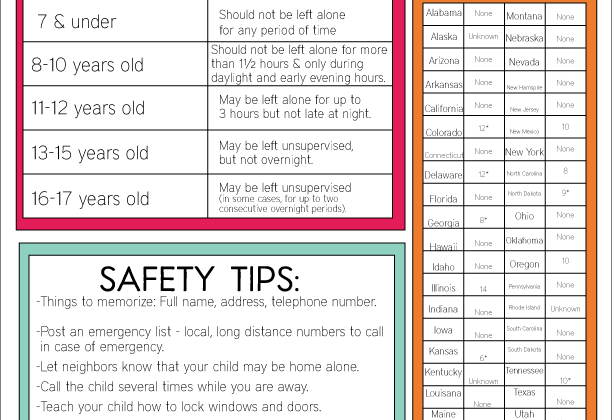 You can also download a printable babysitter sheet that has important information on it to post at home all the time. Rules about the neighborhood and friends. Can he or she go outside at all? More important spell-it-all-out topic. As a general rule, young kids shouldn’t be turning on the oven or stove without adult supervision. But as they get older, they should be able to be in the kitchen. 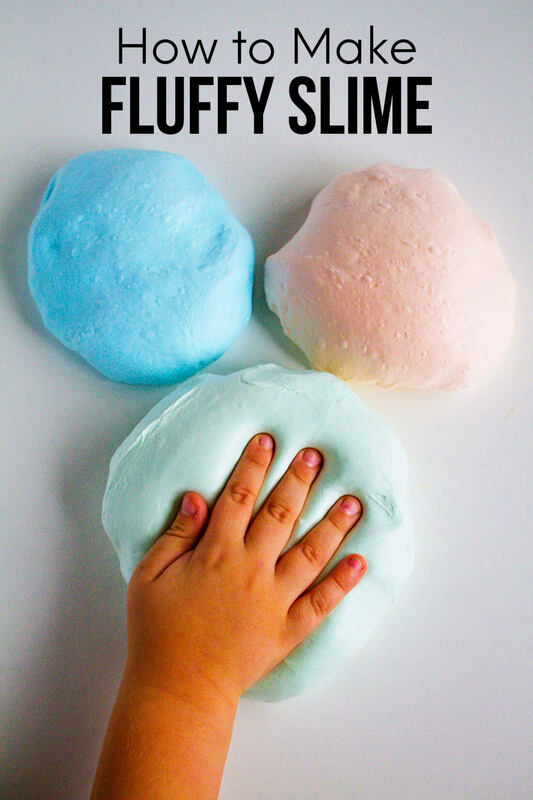 Read more about kids cooking camp and some guidelines for they should/shouldn’t do by age. Let him/her ask any questions or address concerns. You don’t want to give them too much information to scare them, but you do need to have an open conversation to make sure they are comfortable to be left alone. This goes back to – is he or she ready? Some kids at 10 years old are begging to stay home, others never ever want to be left alone. Note: The chart below has suggested guidelines. 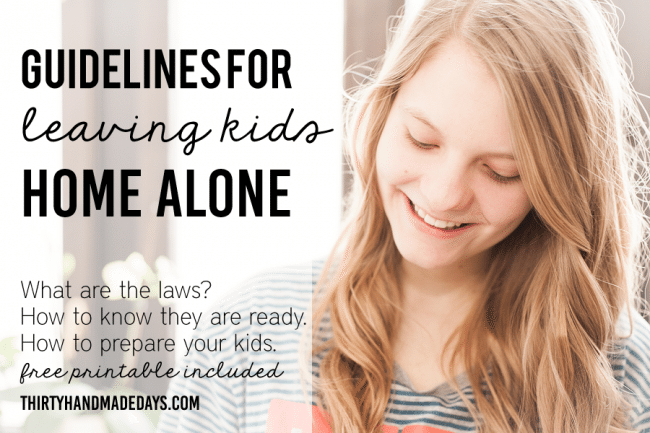 I gathered the bulk of my information from this post: When can you leave a child home alone? Age restrictions with sources were found here. I have asked police officer friends for what is legal in California. Consult your state/county/city as some of it is more specific than just the state. Reading your post made me remember a horrible experience we had with leaving our girls home alone. Ours involved a 911 call and my husband cursing me on the phone. :) I blogged about it, actually, and I’m referring folks back here for your printable because this is such a tricky thing to figure out! THANK YOU for thinking it through to help others! This helicopter parenting is getting a bit extreme, we’re raising a generation that’s completely dependent (well, I’m not, my child is far from a helicopter kid). When I was 11, I was responsible for getting my younger siblings to/from school and watching them for 3 hours until my parents got home; I also drove to/from school and my worked a job after school. That wasn’t long ago, I’m in my 20s, statistically the world is becoming a safer place… letting your child learn & grow without coddling their every move is a great way to teach independence and responsibility. I can’t imagine the day some of these over-protected kids are sent off to college lol, they’ll be crawling back home in weeks! Let your child learn who they are, and what it means to be responsible… drop the helicopter. I think you have the wrong information for Illinios. It is mainly left to the parents discretionary Illinios. The law only specifies that it is illegal to leave a child under 14 home alone for 24 hours. Would you please update this on the chart. Thanks! I have a 7 yr old, Who is responsible, capable & a good listener. I leave her home while I walk the dog early in the morning or after her bed time at night. I do think she is capable of spending an hour or 2 alone..( I have a teenager who enjoys sleeping late on her off days, so she basically is alone) I don’t think I would be comfortable leaving her while I drove to the store for 15 minutes if no one was home. What if something happened to me, while she was alone. Glad readiness was the first thing pointed out in this article. Kids are ALL different. Also, “older” isn’t necessarily “safer” once you get past a certain age. My husband has horror stories of being a teenager with Mom at work, concocting experiments with his brother in the kitchen…one or two exploded and one involved bleach…the ceiling had a giant permanent spot. It’s an old family story. I couldn’t agree with you more Melanie! 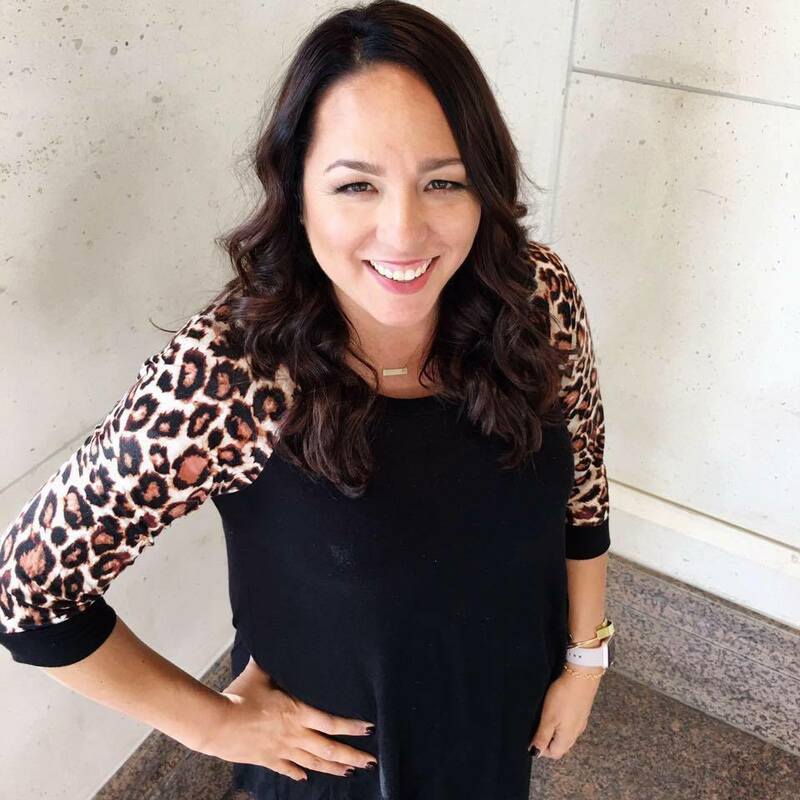 Daycares in Florida stop taking kids 12 and over, so now what???? You as a parent should know weather or not your child can handle it. And it really reflects on you and how you have raised your child. They need responsibility and it builds trust between you and your child. Unless the child is disabled..that is generally not a reflection of the parents but a genetic abnormality. You should check with your local YMCA. See if they have some programs for your child to be involved with. Y’s have a great history of helping kids stay out of trouble and helping them to excel in life. Sorry folks, I cannot agree. It takes only a second for someone to break into a house and grab a child . It takes 2-3 mins to choke to death. Your house might not catch fire and burn to the ground in 15 minutes but you cannot assume nothing will happen just because “it’s unlikely”. And let’s be real, teenagers with too much free time and too little supervision do stupid things like make babies and use alcohol/drugs. And if you think that your kid can handle an emergency, you’re wrong. Most adults can barely function during an emergency. As a 911 operator in Los Angeles, I hear the worst of the worst and believe me — you will never forgive yourself IF something happens. Most emergencies happen when adults are present. None of us are exempt from the difficulties of life, but better to be there for your kids than take the chance and be wrong. ^^ Couldn’t have said it better! Helicopter Moms = insecure kids who can’t do a thing for themselves and lack confidence to handle real life. End of Story. Honestly, coddling your children and treating them like they can’t be trusted to be home alone for 2 seconds won’t help them function in society. So we should we with them every waking and sleeping moment until they turn 18 because something “might” happen???? Take your meds and go away. And although what you say is true, you can not live your life playing the what if game. (You shouldn’t drive your car cause what if you get in an accident.you shouldn’t go to the web movies because what if it gets shot up. ) This world is a horrible place with horrible ppl, but it’s the world we live in. So teach your kids and then let them live life. Some kids actually can handle emergencies if taught well. When I was about three I landed on a blade and almost cut my toe off….my 9 year old sister was able to provide care and get the neighbors in time to take me to the hospital and get my toe fixed. She handled it just as well as if my parents were actually home. Also, my 5 year old niece knows how to properly perform CPR and rescue breathing. So, yeah if you teach your kids right they can do more than you believe. This is SO true! My sisters and I were left home alone when we were kids and the window fan caught the wooden window on fire. We smelled the smoke and knew where to get the fire extinguisher and put the fire out with no trouble. You have to teach your kids what to do and trust that they can do it without you or we end up with “children” in their 30s who can’t do anything for themselves. its Scaremongering that says that your child may get snatched, etc, statistically a child is much less likely to get taken today opposed to 30 years ago, also even at its worst you are still just as likely to have a plane fall on your house. A child should be able to be left from about 11 onwards depending on the child, and not overnight, just while u pop out for shopping, etc. These comments here that say you are taking a risk of your child being abducted may as well say u should never travel anywhere on roads because of the number of fatalities every year, (and even taking a bath is more risky than leaving your child alone for a few hours). Get a grip with reality people. Anyone who believes this is asking for trouble. At one time, this may have been true. Let something happen to one of your kids when you are not there, and Child Protective Services will be taking them into protective custody. And anyone who thinks that you can leave a 13-15 year old unsupervised in today’s world is really asking for serious, life altering trouble for that child. We do not live in the same world we did 10 years ago. No, we don’t live in the same world we grew up in. Statistically speaking, we are safer! Check the stats, violent crime is down from when we were kids. What has this country come to. 14 in Illinois??? That is totally overkill. The NYC Department of Education allows kids as young as 10 to go out to lunch during a school day, and expects that 5th graders can get home by themselves. While I think that’s a little young, it at least gives parents the choice of when they think their kid is ready for such responsibility. I’m as liberal as they come, but I think in this case, parents know best and we have to stop arresting parents for letting their kids play alone outside. Parks should be safe, kids should be allowed to take safe risks. And for certain any kid over the age of 9 should be allowed to be at home alone for an hour or so at a minimum. I just wanted to point out that the chart is a bit misleading when it comes to Illinois law. 14 is the statutory age, but the Illinois Juvenile Court Act provides many factors that can lower the age considerably depending on the situation. I have been a certified juvenile police officer in Illinois for 16 years and just wanted to clarify things a bit! CT has a suggested age of 13. I’m not sure your facts are accurate. When I was growing up in South Carolina it was illegal to go home alone under age 12 (for any period of time). Daycares and schools could report parents for allowing such to happen…say getting off the school bus to an empty house or dropping out of daycare with no other plan lined up before age 12. I meant to say I do like this post and appreciate the suggestion information. I find the schedule a bit too strict on some points. I am quite sure a 17 year old can be left overnight for more than 2 days. I would go alone on a holiday when i was 17 or with some same age friends. I am sure a 15 year old could be left overnight. In fact When I was 14 and very homesick my mom let me go home by myself… a 2.5 hr train ride and I spend a week alone at home, even buying groceries. I agree with you. I think it all depends on how mature your child is at that time! I went to europe to visit family at 17 for 2 months. Traveled alone and Im fine. Best time of my life. Gotta let your kids live a little.